This Monday marks the 30th anniversary of the hit fish-out-of-water romantic comedy "Crocodile Dundee" — from which its two leading stars struck up a real-life romance, and, yes, also broke up a marriage in the process. 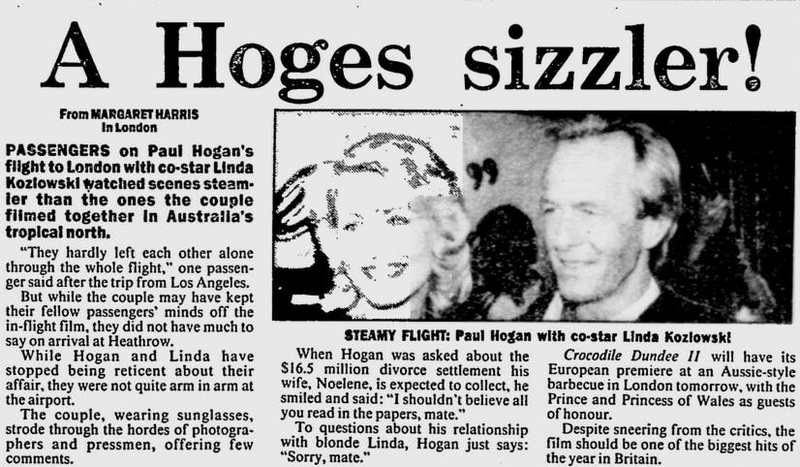 Paul Hogan, who famously delivered the film's most famous line, "That's not a knife ... That's a knife," had five children with his wife Noelene Edwards by the time he started work on "Dundee" — which went on to become the No. 2 movie of 1986, grossing nearly $330 million worldwide. Just as Pitt divorced Aniston, married Jolie and had children with her, Hogan divorced Edwards, married Linda Kozlowski and had a child with her. Both Jolie and Kozlowski later filed for divorce, citing irreconcilable differences. While this sequence isn't uncommon among Hollywood power couples, the facts are eerily similar considering the timing. Paul Hogan and Linda Kozlowski on the set of their new film 'Crocodile Dundee in Los Angeles' filming in Venice Beach, Ca. 9/20/00. Photo by Kevin Winter/Getty Images. Like the Jolie-Pitts, Hogan and Kozlowski were the focus of intense media scrutiny when their affair started leaking to the press — especially in Australia, homeland of the man who played Michael J. "Crocodile" Dundee, where he was considered a national treasure. The press was onto their affair by at least June 19, 1988, when a Sydney Morning Herald article covered a steamy transatlantic flight between the two "Dundee" stars as they set out to promote the sequel to their '86 hit film. "They hardly left each other alone through the whole flight," one passenger is quoted as saying. By November of that year, their romance was treated as common knowledge — in Australia, at least — evidenced by an article published by local publication The Age that reported seeing the two stars "cavorting ... both on and off screen." Hogan eventually divorced his wife in 1990, following 28 years of marriage. He would marry Kozlowski that same year. Hogan was 50 when he wed 32-year-old Kozlowski at their newly built $3 million home in coastal New South Wales, Australia. That same year, a Los Angeles Times piece reported how the actress — best known for being and playing Hogan's love interest — was eager to "prove herself in film without [her] husband." The two starred together in four films in total, including the 1990 flop "Almost an Angel," with Hogan playing a small-time crook who becomes convinced he has become an angel. They also headlined three "Dundee" movies, ending with 2001's low-grossing followup "Crocodile Dundee in Los Angeles." Hogan and Kozlowski had one son, Chance Hogan, who is now in his late teens. The celebrity couple stayed married several years longer than Pitt and Jolie's two years (assuming the divorce gets finalized) — 24 to be exact. Divorced the same year Jolie and Pitt wed, in 2014, Hogan is now 76 years old and Kozlowski is 58 — and the two are thought to be amicably split in the time since the actress got a reported $6.2 million in their divorce settlement. Pitt and Jolie will always have "Mr. & Mrs. Smith," and Hogan and Kozlowski will forever have "Crocodile Dundee."